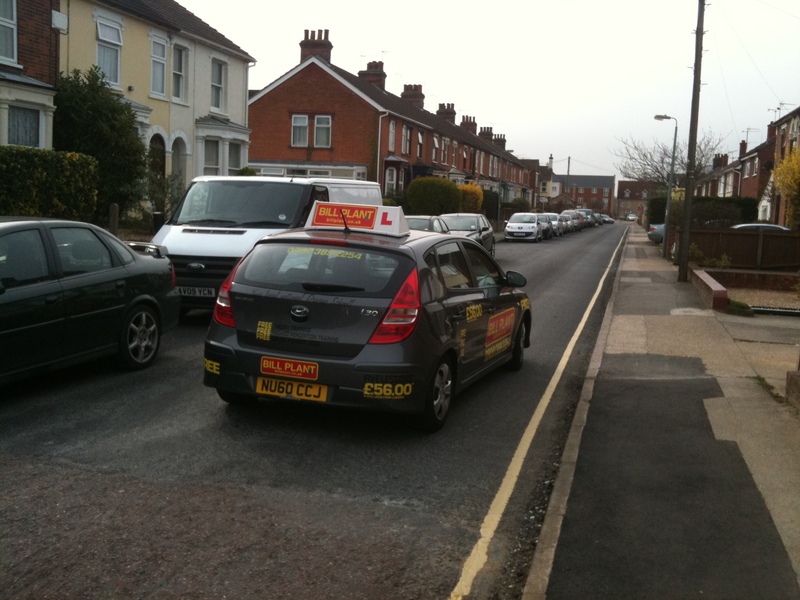 Driving instructors are there to show people how to drive. For one driving instructor this unfortunately included a demonstration of how to drive up onto the pavement to avoid walking anywhere; for another it was a demonstration of how to take the police to task about their own illegal parking and winning a public apology! Back to the first story. This is about a driving instructor for the Bill Plant Driving school who drove up onto the pavement outside his pupil’s house to avoid the inconvenience of parking further away legally and walking. He then demonstrated to his pupil how to tell a pedestrian (me) that it was OK because he ‘had only been there for a few minutes’. Here are a couple of pictures, the first is of the vehicle as the instructor dismounted the pavement with the pupil as a passenger. The second was taken after I have spoken with the driver. The second story is more inspiring. 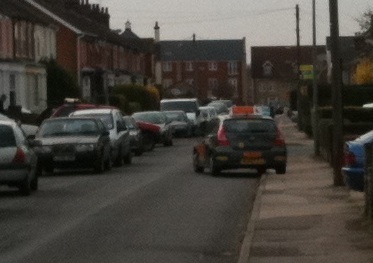 It is about a determined driving instructor who challenged the police about their parking and eventually got an apology. The police had parked their van illegally on yellow lines alongside ‘police no parking’ bollards outside a patisserie thereby totally obscuring the view for anyone, including this instructor’s 17yo pupil, who was trying to exit from a narrow side street. Rather than accept that they were in the wrong the police unfortunately tried to turn the attention onto the instructor by saying that he had committed an offense by leaving a learner alone in charge of a vehicle! Not to be discouraged the instructor had his photo of the incident published in the local paper alongside an article about the incident and got a public apology from the police. This is important stuff. Culture is passed on by example and in particular by teachers. These examples show the difference between good teaching and sloppy teaching. I am now going to email the Bill Plant Driving School. Good luck with getting a response. Our car, parked outside our home on a residential road in Cambridge, was hit by an AA driving school car a couple of weeks before we emigrated. No real harm was done, but as they didn’t stop and check, but reversed and drove past instead, they didn’t know this. I wrote a letter about it, including registration, time etc. They never replied (our mail was forwarded for a year after we left). Amazing! I agree, however it can’t do any harm to publise the incident and it is just possible that the driving school may care enough about their reputation to do something. It does however neatly illustrate how car culture is maintained over time. I see no link to any ‘app’ and anyway I really don’t think it is helpful in the grand scheme of things to ‘vent ones rage’ on bad drivers online. Personally I prefer to encourage pedestrians to gently draw attention to selfish motorists’ decisions in relation to where they leave their which over time might just lead to a wider change in attitudes on the matter.